» "Any screen, anywhere, any time"
Distribution of film and television across the Internet known by the Telecommunications Industry as Over-The-Top (OTT) is quickly emerging as a distribution medium with the potential to challenge traditional film and television industries? and consumers' engagement with content. Whilst much literature exists in relation to technical and industry challenges, little work has focused on consumer attitudes and perspectives. This paper presents the findings of an exploratory study into Australian consumers? current television viewing practices, and their understanding, interest and concerns in regards to OTT distribution. Six focus groups of four to seven participants were undertaken, with a total of 32 participants contributing to the study. Being an exploratory study, much of the findings present participants' opinions and practices. The findings from the study found that participants were generally unfamiliar with the phenomenon; and whilst expressing their interest and readiness for change, a number of concerns were identified. Notable concerns included the capacity to regulate the new medium, censorship of the Internet and capability of the Internet to deliver video content. The emergence of Over-The-Top (OTT) distribution of film and television across the Internet has the potential to change consumer?s engagements with film and television in much the same way that the music industry has been transformed by digital distribution. Unlike traditional Free-to-Air television delivered over a terrestrial broadcast network, or PayTV delivered over a service provider's managed network, OTT distribution utilises the public Internet where content is carried over one or more carriers? or carriage service providers' (CSP) networks before reaching the consumer. By bypassing traditional television distribution networks, OTT offerings provide consumers access to content across a range of connected devices (illustrated in Figure 1 below). OTT distribution changes the landscape into an environment where content can be consumed on any screen, anywhere, any time with the potential to change the way consumers engage with film and television. The first; to capture consumers? current practice and understanding of OTT, with the aim of gauging consumers? readiness for the new distribution model. The second; to introduce consumers to the OTT distribution model in a consistent and repeatable manner such as to gauge their interest and concerns. In doing so, it was hoped to better understand factors affecting OTT adoption and foster further research in this domain. This study was undertaken in the months of August and September 2012 in the State of Victoria, Australia, as part of a higher degree by research at Charles Sturt University. Ethics approval was obtained from the university prior to undertaking this study. Classical ethnographic research methods of informal and semi-structured interviewing were used. Focus groups provided a ?holistic approach to the study of cultural systems? that allowed ?the study of the socio-cultural contexts, processes and meanings within cultural systems? (Whitehead 2005). Focus group participants were recruited via publicly advertised sessions at prominent locations around the Melbourne CBD and online via social networking sites. Consent was obtained from each participant prior to the commencement of sessions. Six focus group sessions were scheduled and attended by the participants and moderator. Participants' gender, age, employment and educational level varied with each session, providing a range of views and perspectives (See Table 1 below). Each session was structured to assure isolation of consumers? current practice and understanding, referred to as ?pre-contextual? responses in which participants presented their opinions without influence beyond that presented in the studies? information sheet and website (www.ottresearch.com/2012study). Participants were then presented with a brief history of telecommunication and media convergence, which concluded with an explanation of OTT distribution. Subsequent expressions of interest and concern, referred to as ?post-contextual? responses, were presented along with responses to the central question. Within the structure, participants were encouraged to openly express their thoughts on the topic, and discussions were largely responsive and adaptive to the situation of the group (Fontana and Frey 1994). All focus group sessions were transcribed verbatim. A number deductive categories based on the sections of the focus group sessions provided a starting point for the coding of the text, as listed in Table 2 below. 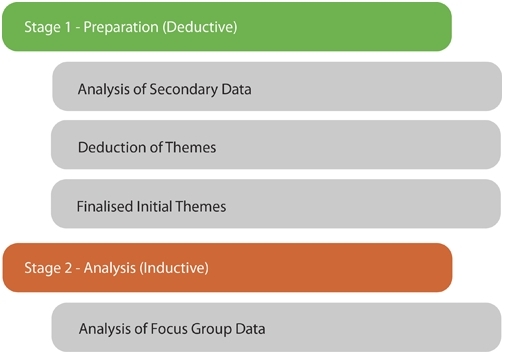 The analysis process involved an initial deductive process, following the analysis of secondary data sources and a second stage, comprising inductive analysis of the data actively collected from participants in focus group sessions, as illustrated in Figure 3. Figure 3 ? Stages of data analysis. The unit of analysis and categories were guided from those identified in the study design. In the process of analysis, other pertinent or relevant themes were defined and added to the original categories in an inductive manner. These were then tested on a sample of texts, before finally applying this to the whole dataset. The coding of the data was checked for accuracy before concluding the analysis. As this exploratory study intends to be extensible, a repeatable structure was devised to allow the finding of other studies to be cross?referenced and their findings analysed. The report aimed to contain ?sufficient description to allow the reader to understand the basis for an interpretation, and sufficient interpretation to allow the reader to understand the description? (Patton 2002, p.503-504). The technique of data triangulation (Denzin 1978) was used to ensure credibility (Bradley 1993, p.436). Adequate data sets and rich description were provided to allow others to find the study useful (Lincoln & Guba 1985, p.316). To assure conformability (Bradley 1993, p.437), the researcher engaged triangulation, open admission of the researcher?s background, belief and understandings; extensive description of the method used to arrive at the findings and identify any shortcomings in the methodology and their influence on the findings. The study found that participants? television viewing was as a largely personal undertaking, in which individuals utilised varying means of assessing content. A balance between need and convenience was identified and in many cases the participant felt a sense of control in the act of making their selection of available offerings. ?I wouldn?t say I use the Internet to watch TV, not that I am not interested in it, but it?s just that I find it a bit easier? (Male, 35-44) whilst another stated ?I find television if anything, frustrating and limiting in what it offers? for me it's the Internet, I watch content regularly? (Male, 65 and above). Convenience driven behaviour included participants using Digital Video Recorders to ?forward through the ads rather than watch them.? (Female, 45-54)and catch-up television, such as ?ABC iView? (Female, 35-44), that allowed participants to watch their chosen program at a later time. Television watching mostly centred around the home on a traditional television set watching Free-to-air television. PayTV or subscription television was not common and those who had subscribed indicated that they ?pay too much? (Female,45-54). ?we don?t have a TV as such, we use our laptops and computers as viewing platforms for mainly TV episodes; also use ABC iView and that is quite good.? (Male,25-34). Little reference was made to Smart televisions or devices, one participant stated ?We have a Smart TV, but don?t have the TV connected to the Internet ?(Male,25-34). Another participant stated ?We purchased a SONY TV which has given [us] access to, or partial access to, a library of movies that they actually have under the distribution rights? (Female, 45-54). Where participants were unable to find content via domestic channels, Internet alternatives were sought, including examples such as International News from ?Al Jazeera? (Male, 65 and above), Indian cricket from ?cricktime.com? (Male,35-44), Chinese Movies from ?youtube? (Male,25-34), Indian TV ?online? (Female,25-34) and Pakistani TV from a ?jadoo Box? (Male, 25-34) that streams Internet video to a television set. Behaviours surrounding movies differed from the convenience sought in television viewing. Participants generally preferred to go to the cinema to watch a movie, stating: ?You will still want to go out and see the actual cinema on a big screen, as far as I'm concerned? (Male, 35-44). Some, instead of going to the movies sought to ?acquire films via the Internet? (Male, 25-34) or by ?downloading movies directly from the web? (Male, 35-44)or ?on the Pirate Bay? (Female, 25-34). Others simply preferred to ?go and get a DVD? (Female, 55-64) or used ?Quickflix ? where they send them out in the mail? (Female, 35-44). Illegal peer-to-peer acquisition or using bit-torrents (Hu et al., 2011, p.129) of films was commonplace. Some participants were hesitant to admit to this practice whilst others were more forward, one participant stating: ?as much as I like pirating things and getting things for free, I do want to support people that have been so creative? (Male,25-34). Table 3 below lists key themes identified in participants? current practice. Overall participants presented little understanding of OTT distribution, some participants stated that they had ?no idea what Over-The-Top delivery actually is? (Male, 35-44), and that they ?don?t quite get what that?s all about? (Male, 65 and above), whilst some responded rhetorically, questioning: ?So, you mean the film over the Internet?? (Male, 25-34). ?I am going to admit that I thought Over-The-Top technology, was just that, Over-The-Top and I just assumed it was something that was Over-The-Top. I didn?t realise that it was OTT and it actually meant Over-The-Top? (Female 55-64). Others focused on the exact term ?Over-The-Top?. One participant stated: ?I haven?t heard of that. I probably heard of cloud but I am not too sure with that? (Male, 25-34). ?Because the Internet has become so quick you can watch TV, movies, straight from the Internet with no lagging. It expands the idea of having? IT online as a trend. I think in the next 5 to 10 years nobody is going to go to the cinema or theatre anymore? (Male, 25-34). ?I was aware of iView, the technology that exists, but wasn?t aware that that was actually the term that is relevant to technology? (Female, 35-44). Overall OTT distribution of film and television over the Internet was not well understood. Older participants were largely unaware, whilst younger participants were aware of commercial offerings from Australian Free-to-air television providers or current Internet offerings. Themes identified are listed in Table 4 below. ?For me I am interested when I can see my house with TV or Internet I can connect with any program, any interest for myself? (Male, 35-44). ?I think that the OTT distribution will become much more popular, specifically for the younger generation, I see people using it all the time and I think the more people will use it, it will become clearer? (Female, 35-44). ?That?ll be the ultimate. The chance to revisit all the shows you never got to really see? (Male, 35-44). ?? the vastness and accessibility of it is going to give people choices. Ultimately, all of a sudden we are going to be opening ourselves up to what maybe 10, 15 years ago was three or four channels and suddenly being able to access hundreds of channels, because that?s what the accessibility of this is clearly going towards, which means that you can actually tailor what you want, when you want, how you want? (Female, 45-54). ?It implies, but we don?t actually know, if there will be more choice. So what does that actually mean? I hope that that will mean more choice, but does that mean that Channel Seven will show programs that traditionally have been shown by Channel Ten. How does it work? They go and they pay a licence fee to play these shows, particularly the big shows, so what does that mean? Any movie, anywhere, anytime?? (Female, 25-34). ?? you don?t have to have this for that and that for something else. You will just have one? (Female, 65 and above). ?It is good to have an alternative to DVD, not having to worry if you have the resources to get it? (Male, 35-44). ?We have more control over the content, you know I can pause it, I can forward, I can wind back, whereas in a real TV show you won?t have any control. If your kids are watching it, obviously you can?t do anything, whereas in OTT you can skip that part and continue? (Male, 35-44). ?I do think that OTT does facilitate local media to be made readily available. A friend of mine has a little show called ?The Rap News? and that is a locally produced thing. It is quite well known in the community but also internationally as well? (Male, 25-34). ?It encourages people to be more creative than having to face investors, budgets?, I enjoy that. It encourages creativity? (Female, 25-34). ?You can actually see it now. I know that with Foxtel, they are offering Foxtel to your mobile or your tablet device; you can get that anyway. You are seeing more channels directed at specific peoples, to specific markets? (Male, 25-34). ?I feel like this is the status quo, this is where we are going now? (Female, 25-34). In analysing participant responses in regards to concern, some participants indicated that they were not concerned or were unsure, however the majority expressed concern which varied a great deal and a number of themes were identified (listed in Table 6 below). ?From a technical point of view the quality of the online media is not that great in Australia because we don?t have very good Internet connectivity and to get good connectivity you have to pay quite a large amount of money. If you access OTT content on a regular basis, that content is not as cheap as it could be. Is the NBN going to solve that problem?? (Female, 35-44). ?The most important thing for Over-The-Top is the moment you click on the Internet, how fast is that? If you are using the broadband Internet you have 3G now so you can?t pretty much watch anything now, it is pretty bad. 4G may make a difference. The next generation of broadband ADSL, it is fine and the next one is coming, it?s called the National Broadband Network. With the speed of the Internet, Over-The-Top will have a chance to compete with the other? Because you have to lay on top of the other Internet. So, for me the concern is that you still have to subscribe; you still have to have the Internet speed? (Male, 25-34). ?Speed, I think that will get better anyway. Well the NBN is rolling out as we speak. You would hope that in a few more years connections around the world, around Australia anyway, would get a lot faster than what they are currently? (Male, 25-34). Cost was presented as a consistent concern from participants, asking about the cost of implementation ? ?who is going to pay for it?? (Male, 35-44)and ?Who?s going to pay for the massive database that they?re thinking of building?? (Male, 35-44). ?I think we don?t know what the price is going to be. It is hard to say whether it would be something we would utilise or not. We don?t know what the content is so whether it is of interest, whether it is that push pull marketing type thing. If it creates interest you might be willing to pay for it? (Female, 35-44). ?The cost! I think it always comes back to the cost!? (Female, 35-44). ?Where will OTT get its material from? It?s from what?s there already. It?s not coming up with new material? (Male, 65 and above).
? ?the way I see it is that it is going to be the same stuff that is available now but just a different way, different channel of getting it to you? (Male, 35-44). ?And it also goes back to content too, depends on like me as a consumer, I have no say really what is going to come in anyway. Somebody might think I want to watch this, or this is good for me to watch, but I haven?t got much say in it anyway. It depends on what is going to be shown and on whether it is good, bad or indifferent? (Male, 65 and above). ?I just wonder if ?Over-The-Top? can address that distance between what is delivered overseas and delivered here? (Male, 35-44). ?How are you going to censor? C,G,MA? (Female, 25-34). ?Anything you can see on YouTube, for instance, you have guidelines that people can see, right now on Australian TV. If you just go onto the Internet, there are no controls; you can see all sorts of stuff, which you shouldn?t be able to see? (Male, 25-34). ?How to prevent, let?s say, kids watching inappropriate content, how are we going to prevent all those? Whereas television is going to be in the hallway so you know they are sitting there watching alone and someone somewhere will be monitoring them? (Male, 35-44). ?We are used to Free-to-air television. We are not used to paying as a whole society; we are not used to paying for television. Paying for Television is still quite new, in this country. And I think people have just grown up with it being available, why would you pay for it?? (Female, 45-54).
? ?to replace Free-to-air TV, well that?s the concern, that?s the only concern, where government still has a stance, still has Free-to-air? (Male, 35-44). "Critical information shouldn?t be something that you have to pay for? (Female, 35-44). ?It is a double-edged sword, it could be both ways. It would be easier to create movies, I could create a movie right now of us sitting here and then upload it to YouTube the next minute and it would be there for people to view. So you could do a lot of local media in that sense, but you also lose on the professional quality, I think? (Male, 25-34). ?How are we going to ensure that our identity is maintained in a way that is reflective?? (Female, 25-34). ?Any screen, anywhere, anytime? is the catchphrase of the OTT industry. The question ?Are you ready for this new paradigm?? was asked of all participants and whilst the largest group of responses indicated their readiness (41%), many participants expressed varying opinions of which 3% were intrigued, 10% were unsure, 2% requested more information, 19%, were not ready, 13% were indifferent, and 3% did not respond (see Table 7 below). Digital media convergence has seen the Internet and associated World Wide Web transition in the last decade, from a largely textual service to a platform distributing audio and video. The increase in Internet connectivity speeds, both overseas at 2.7 Mbps and in Australia at 3.6 Mbps (AKAMAI 2011), has enabled the Internet to become a platform for the delivery of high-definition video. A white paper by Cisco Systems entitled ?Cisco Visual Networking Index?, claims that by the year 2013, 90% of all Internet traffic will be video (CISCO 2011). This forecasted increase of video traffic over the Internet can been largely attributed to the emergence of Over-The-Top (OTT) distribution platforms, including the likes of Netflix, Hulu and Vudu in the USA. The increasing ubiquity of the Internet Protocol (ITEF 1981) as a delivery mechanism is having a significant influence on regulatory frameworks in Telecommunications and Broadcasting. The currency and relevance of the Australian telecommunications legislation is challenged by ?accelerating advances in technology, product development and consumer usage patterns? (Stanton 2011, 21.5). In contrast, Selvadurai (2011) presents a transformational shift from the traditional regulatory model and proposes that the traditional vertically aligned legislation prescribed by the Telecommunications Act 1997 (Cth) and Broadcasting Services Act 1992 (Cth) be replaced by a horizontal ?layered? model. Selvadurai proposes that the horizontal layers of electronic communication provide a framework that allows for legislation to be developed that better represents the reality of current telecommunications. Here Sevadurai cites (Canon 2003, 167) presenting a model of three layers, the network layer, logical layer and content layer with the belief that such a model provides the benefit of being easier to adapt to technological changes. Sevadurai alludes to the fact that there are numerous obstacles that would arise in such a change and suggests that international experiences be considered. One such international experience is Shin (2010), who presents the challenges faced by the South Korean government in addressing changes to communications legislation to better handle convergence. Shin uses Actor-network Theory as a means of bringing together the legislative instruments and the disparate views held by the Grand National Party (GNP), opposition Democrat Party (ODP), the Korean Communication Commissions (KCC) and the Korean Federation of Press Unions (KFPU). Consequently Shin is able to analyse the ?macro processes of policy innovation? and identify the inconsistencies and tensions among the ?institutions, policies, laws and regulations governing various parts of the converging telecommunications, broadcasting and Internet industries? (Shin 2010, 158). Shin (2010) concludes by upholding the belief of Mueller (1999) that there is no perfect state of convergence and as such should be seen as a socio-political concern and not simply from a technological or multimedia point of view. Whilst Stanton (2011), Selvadurai (2011) and Shin (2010) here present distinct and different perspectives on the challenges to legislation in Telecommunications and Broadcasting, what is clear is that the arrival of the Internet Protocol (ITEF 1981) as a delivery mechanism of media over a public Internet presents many challenges to exiting legislation, one for which there is no clear or obvious solution. Over-The-Top (OTT) delivery of film and television across the Internet holds the promise of the Long Tail (Anderson 2006), providing consumers access to a greater range of content than possible via traditional distribution networks. Barr (2011) presents the offerings of Netflix, Apple, Google and Facebook and how these Internet companies are changing the face of Television in the US, and whilst there is much publicity around these corporations, little real commercial data is actually available to truly examine their effect on traditional television. In contrast Cunningham (2011) introduces possible content applications that the National Broadband Network (NBN) will offer Australians, and identifies the online distribution of film as one such future application. Despite this, Cunningham indicates that the increase in capacity to deliver content does not necessarily translate to an increase in local (Australian) content on major platforms with only 0.5% of iTunes and 1-3% of BigPond Movies and Quickflix content being Australian content. Cunningham alludes to the role of Public Broadcasters, specifically the ABC, and the role of initiatives like iView for catch-up television and the schemes, ABC Pool (a social media space aimed to foster collaboration) and ABC Open (aimed at curating local content from rural Australia) have in promoting local content. Commercial challenges faced in content creation in OTT distribution are widespread. In his article ?Beyond big video: The instability of independent networks in a new media market? Christian (2012) presents the commercial challenges faced by WatchMojo, MyDamm Channel and StrikeTV in the USA in engaging the market. What is clearly evident from the literature is that increased access and capabilities for Internet video do not translate into an immediately abundant ?long tail? and until sustainable commercial models are developed, new technologies will not assist in resolving the availability of content. Weinstein (2010) introduces three classifications of IPTV: Computer Based IPTV; Partial IPTV and Full IPTV. In doing so he blends OTT services with IPTV. OTT services are passed over public carriage networks and whilst OTT services may be delivered across IPTV networks, OTT services are ultimately independent of an individual carrier?s network, unlike IPTV which operates within a closed network, thus the term Over-The-Top (OTT). Unlike Weinstein (2010), Peters frames the environment as ?Internet delivered, high quality television-like video content? (Peters 2010, 27.1) and in doing so, separates IPTV from Internet Video, in which he defines as ?professionally produced long-form content? (Peters 2010, 27.2). Like Peters (2010), the recent ACMA Communications report ?Online video content services in Australia? (ACMA 2012) focuses on ?professionally-produced, long-form video content that is provided over a broadband Internet connection or mobile network in a way that both complements and competes with existing modes of professional content delivery, such as FTA and subscription broadcast television? ACMA (2012), finding that Australians are rapidly engaging online video services. Common to the Australian perspective is the perceived need for a National Broadband Network and a common generalisation of Internet Video Services to include OTT and IPTV offerings. This exploratory study identified that in current practice, participants largely utilised any available means to watch content. Convenience was significant in the act of watching television and where content was not readily available, participants would use Internet based methods to access desired content. Movie watching practices presented a greater focus on quality and participants would pay for a theatrical experience. Alternatively, they would download films directly off the Internet using peer-to-peer torrents. OTT distribution is not widely understood and for the majority of participants the sessions assisted them to formalise their understanding of commercial products like iView, of which they were aware. In examining participants? interest in OTT distribution, interest was qualified by a number of accompanying questions. The study identified key themes of: general interest; variety and choice; simplicity; control; content creation; and cost in participants expression of interest. Concerns were by far the most diverse of the key areas of the study. Here a number of themes emerged that are unique to the Australian context, specifically Free-to-air television and Australian Content. Other major themes included the ability to legislate for the new medium, copyright, censorship and technological concerns in quality of service, Internet speed and Internet usage. How effective legislation and controls on content regulation will be and how locally produced content will fare in the new paradigm remain unclear. Overall, Australian consumers are ready, but the emerging trend will not be without its challenges. The Australian market is unique and distinct in its Free-to-air position. Smart TVs will assist consumers to access OTT services, but without content that encourages users to adopt new methods, Free-to-air is likely to maintain significant influence on television viewing. David, M. & Sutton C.D. 2004. Social Research the Basics. London: SAGE Publications. Denzin, N. K. 1978. The research act: A theoretical introduction to sociological methods. New York: McGraw-Hill. Denzin, N. K. & Lincoln, Y. S. 1994. ?Introduction: Entering the field of qualitative research?. In N. K. Denzin & Y. S. Lincoln. (eds.). Handbook of qualitative research. Thousand Oaks, California: Sage. Lincoln, Y. S., & Guba, E. G. 1985. Naturalistic inquiry. Beverly Hills, California: Sage. Patton, M.Q. 2002. Qualitative Research and Evaluation Methods. Thousand Oaks, California: Sage. Cannon, R. 2003. 'The Legacy of the Federal Communications Commission's Computer Inquiries'. Federal Communications Law Journal 55: 167. Mueller, M. 1999 `ICANN and Internet governance: sorting through the debris of ``selfregulation??. Info. 1(6): 497-520. At the end of the session, participants were asked to complete a set of Likert-type questions which gauged their familiarity before the study, interest, concern and readiness for OTT distribution of film and television across the Internet. The results (Table 8 below) illustrated that participants were not familiar with the phenomenon, similarly interested, concerned and ready. (See Figure 4 below). Figure 4 - Survey Likert-type responses: Stacked Distribution. Greg Paynter. 2013. "Any screen, anywhere, any time" is the catchphrase of the OTT industry, but are Australian consumers ready for this new paradigm?. Telecommunications Journal of Australia, Vol 63, No 1, Article 389. http://doi.org/10.7790/tja.v63i1.389. Published by the Telecommunications Society of Australia and Swinburne University.